Stands. Construction. Assembly. Design. Reprographics. Events. Furniture. 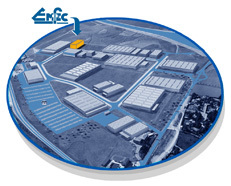 Emfec Zaragoza S.L. In this section you will find all the information of the latest works and projects that EMFEC has carried out for some of its clients. From our Web site it is possible to rent both the furniture and the newest and highest technologies in imaging, audio and illumination. We are partner of SERVICE OCTANORM, and partners of AIMFE and Zaragoza Office of Congresses.